IT parks nationwide have achieved impressive results, offering jobs for a great number of people and attracting capital of giant domestic as well as international corporations, becoming the key to IT growth in the country, reported the the Ministry of Information and Communications yesterday. There are now 4 concentrated IT parks nationwide, consisting of Quang Trung Software City in Ho Chi Minh City (HCMC), Da Nang Software Park in the central city of Da Nang, Cau Giay Concentrated IT Park in Hanoi, Hanoi Software Park. Particularly, at present, Quang Trung Software City in HCMC has 160 companies and startups specializing in software, digital content, IT services, with the total registered capital of more than VND2,600 billion (approx. $112 million). The overall 2018 revenues of these organizations were around VND10,000 billion ($431 million), an increase of 2.5 times compared to 2014. The export value in 2018 reached nearly $350 million, a rise of 38.7 percent compared to 2017. Thanks to this spectacular success, on March 3, 2016, the Prime Minister approved Decision No.333/QD-TTg to pilot the establishment of ‘Quang Trung Software City chain’ to include the software park of the Vietnam National University – Ho Chi Minh City, making it the birthplace of various innovative startup businesses and skillful IT human resources for the city. 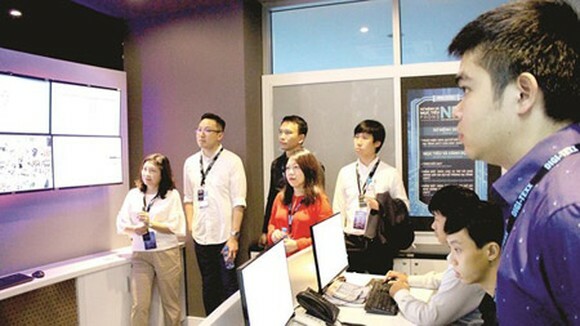 Similarly, Da Nang Software Park has obtained encouraging results lately. With 75 running companies, its total income in 2018 was a massive VND1,800 billion ($77.6 million). Likewise, Cau Giay Concentrated IT Park has been able to attract prominent national IT businesses such as FPT, CMC, and Misa to develop products for export purposes. However, reports from the Authority of Information Technology under the Ministry of Information and Communications show that existing policies for the growth of concentrated IT parks have not been able to demonstrate their guidance capacity, nor can they encourage necessary resources due to their inconsistency. What is more, they can hardly keep up with the fast development of IT in reality. In the meeting, representatives of many IT parks expressed their wish to be considered as a high-tech area in order to gain proper beneficial rights on land use, tax pay, and credit. The representative of Quang Trung Software City said that at the moment, there was no difference in policies to attract capital between his organization and outside ones, so the only factor this IT park could offer is its support, which is barely sufficient. In the Industry 4.0 era, there must be a steering, detailed, and open mechanism to allow free creativity and experiments among domestic IT businesses. Deputy Minister Phan Tam admitted that after 5 years adopting Decree No.154, there are still inadequacy, calling for an urgent adjustment on mechanisms. Thus, he announced that his ministry will try its best to propose a better version in the Governmental Task Program at the end of 2019. Accordingly, Decree No.154 is expected to be more updated with the reality and more suitable for other existing laws like the Investment Law, the Land Law. The Ministry of Information and Communications is going to work closely with other ministries for a higher consistency level of policies for concentrated IT parks while building a detailed strategy on attracting more investment in the infrastructure for these areas.